Well I bashed out the Guildford T to Redhill Y charity marathon walk last Sunday -26 miles in just slightly over 9 hours, so a shade under 3mph which is good going...and I really enjoyed it, and finished strongly.Thank you to those who contributed to the fundraising for Redhill YMCA's work with disabled children. 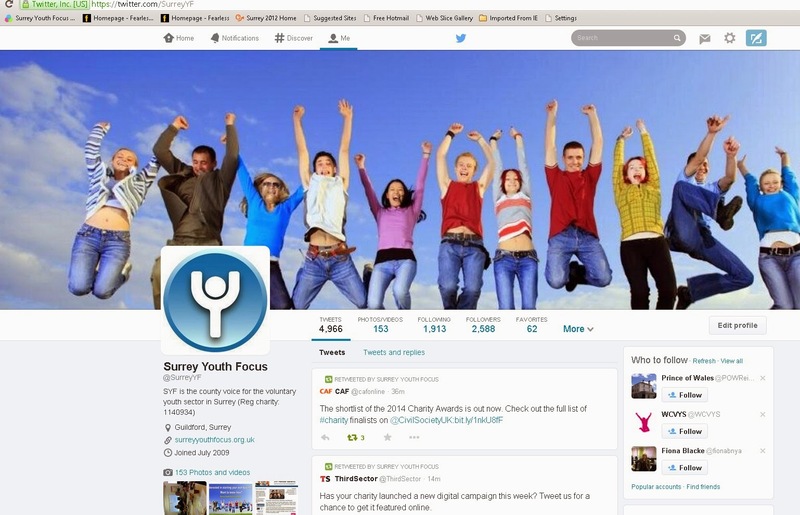 Today, Friday , is going well - the Surrey Healthwatch Board approved a project proposal last night that we submitted at their invitation to undertake market research into the Health needs/opinions of young people. This fits exactly with our "Leadership, representation and advocacy role". I have been running a short strategic context session this morning for a brilliant member organisation of ours; it went well..they gave me a bottle of my favourite red wine..and it was at Polesden Lacy (Nat Trust) which I am ashamed to say I had never been to in all my 27 years in Surrey. I rehearsed some themes which will be contained in the Young Surrey : Strategic Review I'll start writing next week, and these went well. Went to Surrey CC Services for Young People recommissioning conference on Monday; they HAVE made a lot of progress- their needs analysis is a superb bit of work for example, but is "Employability" the only focus for young people /Youth Services? Is co- production a misnomer ...should it be "complementary production" to better convey the notion that the sectors need to blend services together? Otherwise I've been slogging through compilation of all the Pqasso Level 2 papers to accompany our submission for external assessment for this quality assurance mark. We'll submit next week. So it's been a really positive week. Jenny Griffiths OBE stands down on Friday as the Independent Chair of The Youth Consortium for which she has worked tirelessly, and with great skill in often very difficult circumstances. Jenny is retiring to Hampshire where I think she will be painting and walking, but keeping in touch with her many Surrey friends. We have spent a great deal of time on the County Council's invitation to take over and operate Woking Youth Arts Centre. The short version (embodied in a 9 page report) is that we could not make the financials work within the parameters set by SCC. The episode reveals the differences between sectors; we needed to run it as a (charitable) business, balancing income from lettings against expenditure, whilst for SCC Property this is just one of hundreds of properties for which there is a limited "cake" of resources and , frankly, this is not a priority building. We have suggested an alternative way forward, and there is definitely a community need and business potential...a community trust? Grateful thanks to my Chairman and Trustees for being so supportive throughout this episode...we really would have liked to go forward but he financials, the accountancy and legal advice were all against so doing. SO we have moved quickly on to putting in our Pqasso Level 2 bid, which will be made next week , after a final team discussion on Tuesday. There is still a bit of work to do, and the compiling of the documentation is a huge task..but very worthwhile. I will then be moving on to my bit of pure enjoyment, namely writing the next Young Surrey : Strategic Review for the Board on 29 April, plus an Interim Business Plan. Well I walked 21 miles in 7.5 hours on the Sussex Downs last Saturday, and to prove it wasn't a fluke I have the day off today to repeat the same walk. All this in prepartion for the "Y to Y" Marathon Walk on Sunday 23 March. The week has been completely dominated by our detailed Due Diligence work on the costs/income potential of Surrey Youth Focus taking over the management of the Woking Youth Arts Centre. I met with our pro bono property lawyers on Tuesday morning and with Peer Productions in the afternoon about our proposed pricing model. I have since written most of a detailed report on the Business Case. The requirements of Surrey CC Property make it a very difficult proposition as we have now worked through the detail. The key learning point is that if you approach running a youth centre as a business, albeit a charitable business, that has to wash its face, balancing income in, against costs out, you have a very different perspective from a local authority for whom this is just one of hundreds of buildings that have costs that are offset....not by income earnt...but by the taxpayer. The difference becomes between running a business and needing to earn income on the one hand, from deciding how to carve up the cake of competing priorities for taxpayers' cash that is automatically received. These are culturally and operationally very different perspectives. Meanwhile, there was an excellent workshop at County Hall with Youth Service commissioners about HOW to re-commission the £35 mill total budget. In the past the default has been open competitive tender, against which I have constantly argued. However there is now a real prospect of a much more collaborative approach. Very encouraging. The first pop concert I ever went to was by Helen Shapiro who had a great hit with "Walking back...!" Enjoy the sunny week-end...hmm... now where are those boots? I'm about to whizz off to meetings of the Surrey Sports Strategy Board (last meeting for me) and then the Surrey Charity Chief Executives Group. The latter will focus on my favourite theme about the way in which the Public- Private- Third sectors are all blending together. The Cabinet Office is encouraging local authorities to create Mutuals and social enterprises - see Epic - a youth service mutual formed from staff of three London Boroughs- initially in Ken and Chel. By the same token we are working hard on setting up the social enterprise ("Surrey Youth and Community Property CiC" ) to take over the running of Woking Youth Arts Centre from 1 April. We had a first embryonic board of directors meeting this week, and I am meeting with property lawyers next week, and taking advice on tax from our accountant. It is brilliant that staff of a major corporate will be coming in to the building on 16 May (BitC's Give and Gain day) to redecorate etc. Linda is doing a brilliant job on moving CommUniLAB forward as a project ;looking at the value of C'LAB from the perspective of potential funders, and starting to look at the branding/image we want to convey through the all important new website. But the high point of the week was a superb focus group discussion with our three young trustees about the issues affecting young people, and about what young people value. This is key input for me in drafting the next "Young Surrey: Strategic Review". I have written up the draft of what they said, and hopefully they will agree to it going up on our website. There is a link here to the Demos report I keep quoting about "Introducing Generation Citizen"- short version being that young people are interested in global issues, but not traditional party politics about which they are very skeptical. BUT if they don't vote in the general Election will they exclude themselves from power, OR by using their ability to form- disengage re-form in huge numbers using social media, like flocks of swallows swarming, ...will they change the parliamentary model completely? Back on form..played squash last night in brand new sports centre, opened this week. Training walk on Saturday - 21 miles- then the rugby showdown on Sunday afternoon!